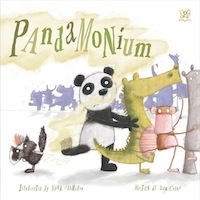 Children will delight in watching the zoo keeper sleep as the animals around him cause pandamonium! Fantastic illustrations by award-winning artist, Mark Chambers, bring each of the animal’s characteristics to life and humorous text by Dan Crisp ensure that each spread is bursting with mischievous fun! Dan Crisp lives in West Yorkshire with his wife Isabel and their children, Tom, Matilda and Caleb. As well as enjoying writing Dan is a professional illustrator and studied illustration in Sheffield and at The North East Wales Institute. He loves illustrating and enjoys karate, the outdoors, cycling and hiking. Great book! Nice illustrations and interesting story! A really cute book with funny rhymes and appealing illustrations. As a children's author myself and a grandfather of four young ones I highly recommend it. A must for any bookshelf! Both Dan and Mark I have represented for over 8 years, i have seen them grow into the most hilarious story tellers ever- I wish them every success with this simply deliciously funny book !! This definitely gets my vote!! Incredible character illustrations by Mark Chambers in this book. Lovely book with great illustrations. My daughters loved it. Best book EVER !!! My kids adore it !!! The illustrations are simply breathtaking !! fantastically fun book to read! A wonderful book for children, beautifully illustrated. Really funny rhyming story! Mark Chamber's illustrations perfectly capture the mayhem that ensues following the skunk unleashing an unsavoury smell. Amber, Primary School Teacher. As an elementary teacher, I highly recommend this captivating story book that any child will enjoy! It is educational as well as a lot of fun to read. A fantastic addition to children's stories. My children particularly enjoyed the comical illustrations. Fantastic book, fun to read and the kids love it!! Great book for bed time reading! A fantastic picture storybook by a talented creative duo!